FBI gag order on national security letter is finally lifted. In February 2004, Nicholas Merrill—who owned a small Internet service provider at the time—was served with an administrative subpoena called a National Security Letter, or NSL. He was asked to turn over a client’s electronic metadata to the FBI without any judicial oversight. Because the NSL was accompanied by a gag order, Merrill was forbidden from ever mentioning the request, even to the person targeted by the FBI—who, by the way, was not even suspected of a crime. Rather than complying with the unconstitutional request, Merrill went to court with the assistance of the American Civil Liberties Union. He spent more than a quarter of his life fighting challenging the legality of a Patriot Act provision that allows the FBI to issue NSLs in the first place and then fighting for the restoration of his First Amendment rights. The gag order was only partially lifted in 2010. In August of this year, a judge ruled that Merrill could disclose what he’d been asked to turn over to the FBI if the government did not appeal within 90 days. That deadline passed on Nov. 30, and Merrill is now free to discuss the type of information the government sought 11 long years ago. Nick Merrill’s NSL attachment, in various stages of redaction. One of [the NSLs] got a list of everyone that went to Vegas over New Years Eve one year. 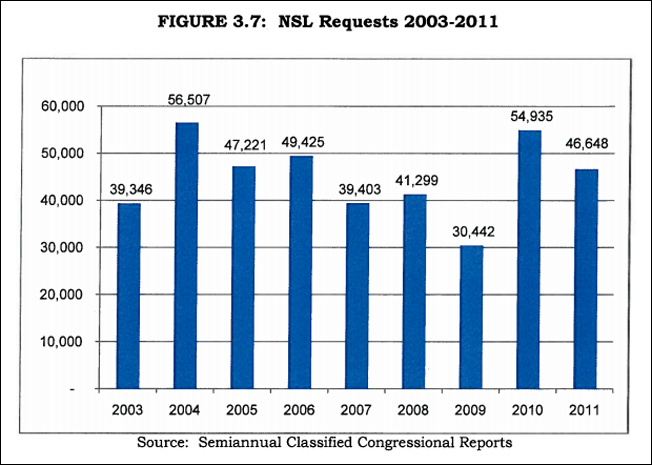 Another few NSLs got the entire phone billing records of 11,000 people. So then you realize that you cannot assume that each letter affects just one person. Now it’s one in 300 Americans? Or one in 100 Americans? Who knows? We are reduced to guessing because we have so little actual data. Which brings us back to the gag orders and secrecy, and how that leads to unaccountability. Because NSLs are shrouded in secrecy, it’s hard to tell whom the information is currently being shared with, what the retention policy is, and whether data is ever purged if a person is never accused of wrongdoing. But in 2007, ACLU policy counsel Michael German, a former FBI special agent, pointed out that “information received through NSLs is indefinitely retained and retrievable,” even if the subject is found to have posed no terror threat. Data is shared with the intelligence community, across government agencies, and even with foreign governments. Some companies have fought back against NSLs by publishing warrant canaries—making public disclosures that they have not received government data requests on a semi-regular basis. In theory, this will allow companies to track gag orders indirectly by seeking a judge’s opinion if the government attempts to force that company to issue a statement saying it hasn’t received an NSL even when it has. “Warrant canaries are cool because they are pro-business civil disobedience. People want to find creative ways to resist, and there are not that many options,” Merrill says. But, as he notes, warrant canaries don’t deal with the underlying issue.